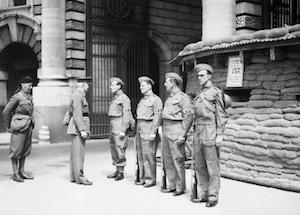 Its announced that over 250,000 men enrolled into the LDV (Home Guard) in just the first 24 hours. Luftwaffe bomb Channel ports and the RAF attack Rotterdam’s refineries. The isolated German troops at Narvik are now close to exhaustion and will be unable to hold out for very much longer. A British counter attack is launched near Arras with armoured and infantry support against Rommel’s 7th Panzer Division, throwing it off balance. A similar attack in the south by a French armoured brigade under General de Gaulle fails after initial success. The French Ninth Army is surrounded and destroyed, its commander, General Giraud, taken prisoner. It’s announced that Women’s Land Army now more than 11,000 strong. Vichy military court sentences 56 NCO’s and privates, siding with de Gaulle to death or hard labour in absentia. All property of free French fighters is to be confiscated. Against strict orders not to attack American vessels, the US merchant ship Robin Moor is sunk by U-69 (Kptlt. Metzler). This sinking of a neutral American vessel is publicly denounced by President Roosevelt and becomes yet another argument for him in his secret desire for bringing the United States into war against Germany. An RAF reconnaissance plane sight the Bismarck and Prinz Eugen in the port of Bergen, allowing the British Home Fleet time to ready plans to intercept them in the earlier hours of the 22nd May. 80 Ju-52s crash land a regiment of 5th GebirgsjÃ¤ger Division to support the hard-pressed paratroopers who are defending Maleme airfield. A British counter-attack at Maleme airfield is repulsed by the now reinforced paratroopers. Royal Navy sinks several small German troop boats, helping to thwart the sea borne invasion of Crete. The Luftwaffe sinks the British Destroyer Juno and damages the Cruiser Ajax, southwest of Crete. Hitler postpones the invasion of Malta indefinitely. Japan allows International Red Cross representatives to visit British prisoners. The Luftwaffe carries out a raid by FW-190 fighter bombers against Malta. The British Second Army arrest Himmler (in disguise) at Bremervorde. The Japanese begin the evacuation of Shuri, on Okinawa. Their losses so far are estimated at 48,000 killed out of a garrison of 85,000.